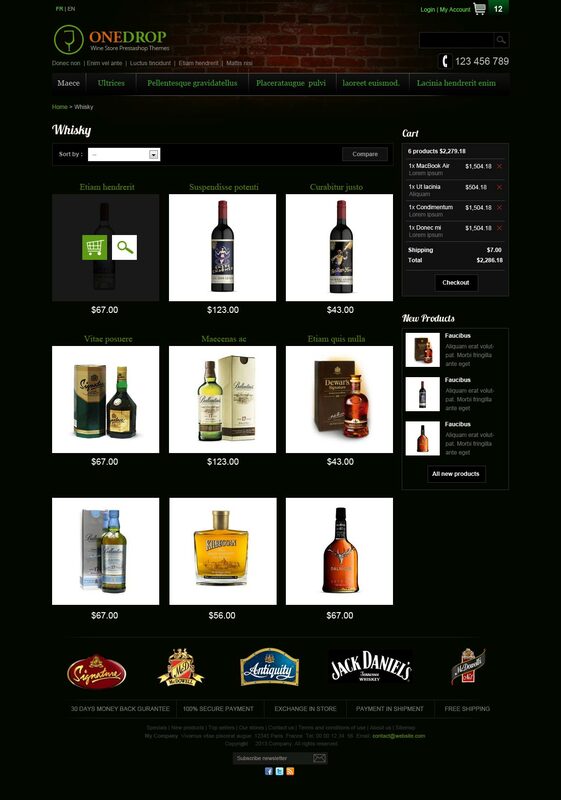 This One Drop 1.0 responsible themes is in dark black color with green color and most suitable for those seller who want to increase their sales on the title of wine, whisky, beer, hard drinks, restaurant. In front page we have focused image slide show with two image banner . This themes is compatible in 3 different language – English, Spanish and French . All the language was translated through Google online language translation tool. This module is located in “Front Office Features” module category . Here you can add and delete images. Image dimensional with 650×400 in jpg/png format is recommended. This module will show in home page only. These two modules are banner modules where you can set image banner with 280×195 dimensional. These modules are will be in home page only. This module is located in “Front Office Features” module category. Here you can set telephone number. This will be show in top portion . Here, you do not have to do any configuration in this module, . This module show manufacture’s logo list with slide effect. To edit manufacture logos you need to configuration from back office of prestashop. Here, we are giving tiny tutor to reset module from backoffice of Prestashop. Normally most of the functionality depends on modules. Here reset module stands for uninstall module and again install module automatically. If you made change code on php file, you need to reset module to get actual output in front office and back office. 1. First of all login your backoffice with your username and password. If you forget password you can reset password and you will get new password in your email which you have mention while you have install prestashop system. 2. After login you need to hover on Module Tab and click on module link. 3. Now you will get list of modules . There are so many module and managed in category. You can see in left side of their category. Or you can search module in search box. 4. Here we are going to reset one module . Let’s say that module name “Quick Search”. Now you need to type “search” in search box. Once you type 3 to 4 characters in search box. We you get popup module list . There you can click on it. 5. Now you will reach in search module configuration. There you will have several link. Now you need to click on reset link.